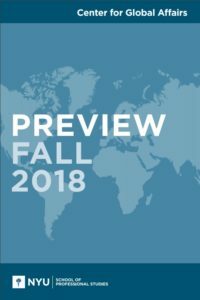 The NYU School of Professional Studies Center for Global Affairs (CGA), one of the most exciting and dynamic programs to emerge on the higher education landscape, explores the latest trends in international policy and examines and vigorously debates critical issues in the classroom and through public events. It is a program that provides the opportunity for individuals of all ages, backgrounds, and nationalities to come together and to explore how to make our world a better and more just place. CGA embraces a world where diplomacy and global transactions occur in a 21st-century milieu comprised of state and on-state actors. Our mission is straightforward—to create a community of global citizens who are capable of changing the world. Some might this is a terribly bold aim for an academic program. Nonetheless, we would have it no other way! CGA’s leading-edge MS in Global Affairs, career advancement courses, and diploma programs, as well as its provocative public events, combine to create an environment where everyone with an interest in global affairs can find a place to contribute and learn. Those who develop these programs are scholars and practitioners, individuals who have had direct experience in the global arena. Everyone at CGA is passionate, enthusiastic, and committed to our ambitious global agenda. The MS in Global Affairs is the flagship graduate program of the CGA, repeatedly ranked by the Foreign Policy Association as one of the nation’s leading institutions in preparing students for international careers. The master’s program provides you with the in-depth knowledge and the contextual perspectives for becoming a successful, well-rounded professional in the global arena. Faculty members are scholars and skilled practitioners, including international attorneys, leaders of organizations engaged in refugee relief and the protection of human rights, diplomats, United Nations staff, activists, economcits, and global energy and environment experts from whom you will acquire both nuances analytical understanding and the methodologies to develop and to implement strategic solutions that address critical global problems. The MS in Global Affairs is a 42-credit program, which includes three components: a core curriculum of four courses, a choice of concentrations, and either a graduate thesis or a team-based capstone project. The core curriculum focuses on the fundamentals of global affairs. Eight distinct and highly relevant areas of concentration are available from which to choose. For more information on our degree program and public events at the Center for Global affairs, please click here.